We’ve put up a few posts about our current exhibit, Helping Shape America: German Americans in the U.S. Congress from 1789 to the Present; this iteration focuses on the 1st and 112th Congresses. 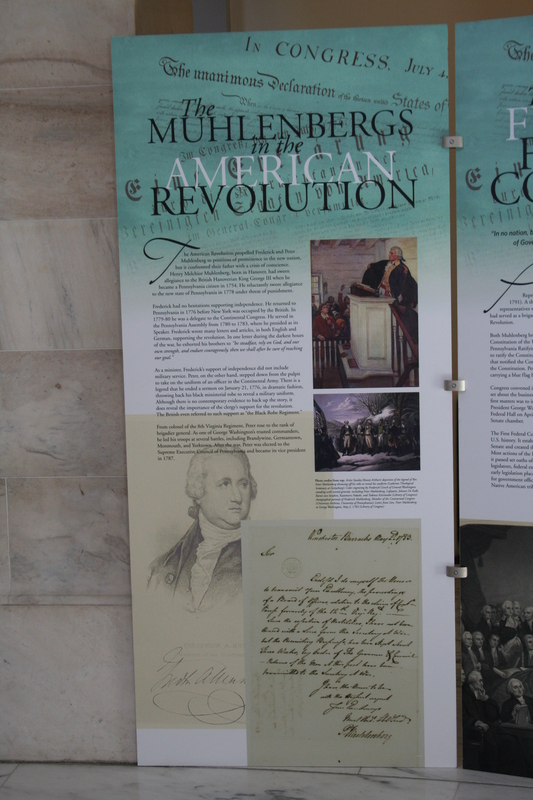 If you want to know more about the Muhlenbergs than myth–debunking, come by the Russell Senate Office Building near the Capitol this week. 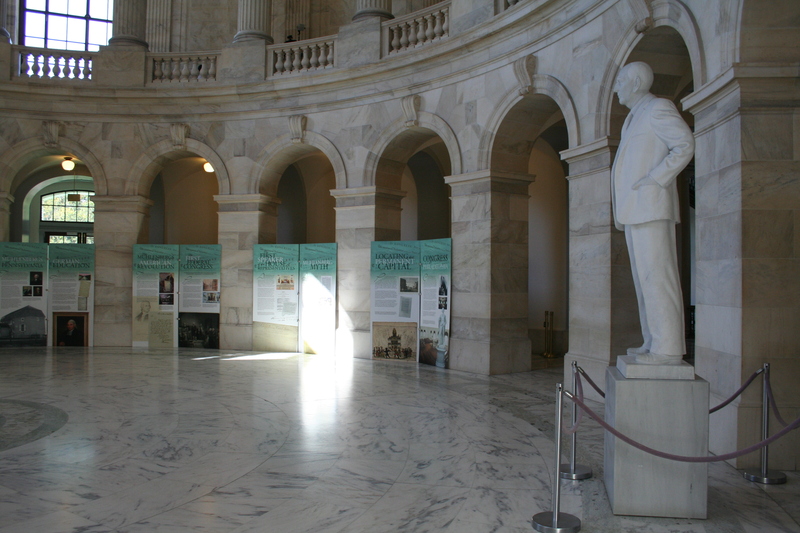 Sen. Russell keeps an eye on the sun-dappled installation. The exhibit is housed in the 2nd-floor Russell Rotunda, and congressional office buildings are open the public (just be prepared to go through a metal detector). It’s there till midday Friday, October 28, so this is a great chance to check it out. It’s free! If you go, let us know what you think in the comments here. 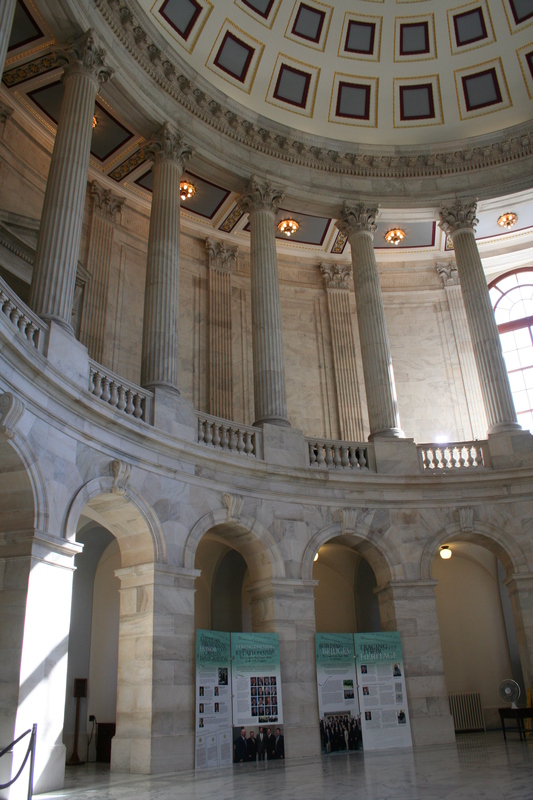 The rotunda provides a grand setting for the exhibit. The Russell Senate Office Building is located near Union Station and is bounded by Constitution and Delaware Avenues and 1st and C Streets NE. Because the Senate is not in session this week, only some of the building entrances are open. The one on Constitution near 1st is a good bet. Read the post about the Peter Muhlenberg trading his ministerial robes for an army uniform? This panel explores that story. Other panel topics range from the entire Muhlenberg clan to current German American members of Congress. Last month we wrote about the “Muhlenberg myth”that wrongly posits Frederick Muhlenberg cast the deciding vote against making German the official language of the US. As part of our October theme, German Americans in Congress, we’ll continue with another rumor or myth that swirls around Peter Muhlenberg, Frederick’s brother and fellow minister and member of Congress. 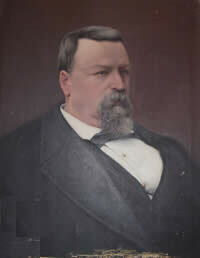 As a minister, Frederick’s support of independence did not include military service. 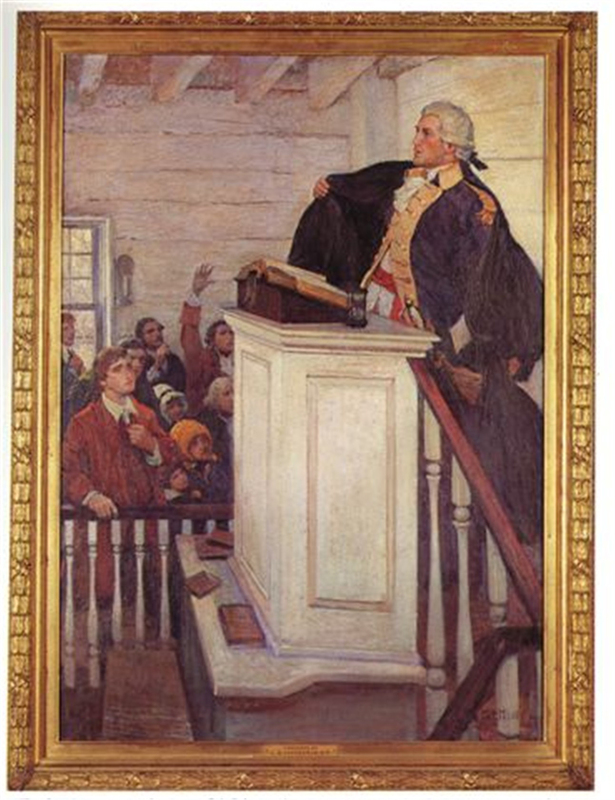 Peter, on the other hand, stepped down from the pulpit to take on the uniform of an officer in the Continental Army. There is a legend that he ended a sermon on January 21, 1776, in dramatic fashion, throwing back his black ministerial robe to reveal a military uniform. Although there is no contemporary evidence to back up the story, it does reveal the importance of the clergy’s support for the revolution. The British even referred to such support as “the Black Robe Regiment.” The myth, however, was so powerful and persistent that Blanche Nevin’s 1889 granite statue of Muhlenberg in the Capitol’s National Statuary Hall Collection depicts him with the ministerial robe draped around his right arm and shoulder as he stands proudly in his military uniform. From colonel of the 8th Virginia Regiment, Peter rose to the rank of brigadier general. 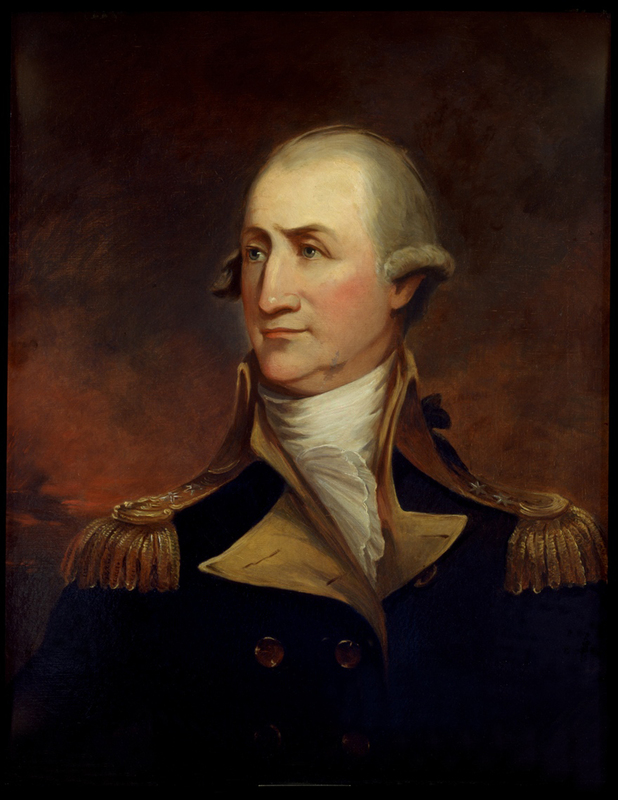 As one of George Washington’s trusted commanders, he led his troops at several battles, including Brandywine, Germantown, Monmouth, and Yorktown. After the war, Peter was elected to the Supreme Executive Council of Pennsylvania and became its vice president in 1787. Both Peter and Frederick supported the drafting and ratification of the new US Constitution and served in the First Congress, which opened in 1789. Muhlenberg descendents continued to serve in the US Congress until the mid-twentieth century. History Detectives on PBS did a segment on a robe at the Lutheran Theological Seminary that may have belonged to Peter. They found no evidence of a dramatic disrobing in the pulpit, but learned that the robe could have belonged to Muhlenberg. A transcript of the segment is available here. 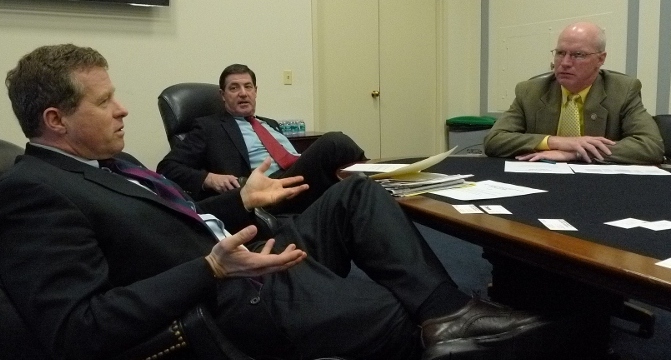 Have a favorite German American member of Congress? Know another myth about a Muhlenberg (Frederick and Peter had 9 more siblings)? Let us know in the comments. The U.S. Capitol Historical Society has joined with the German American Heritage Museum to create a new series of exhibits on the contributions of German Americans to the history of the United States Congress. 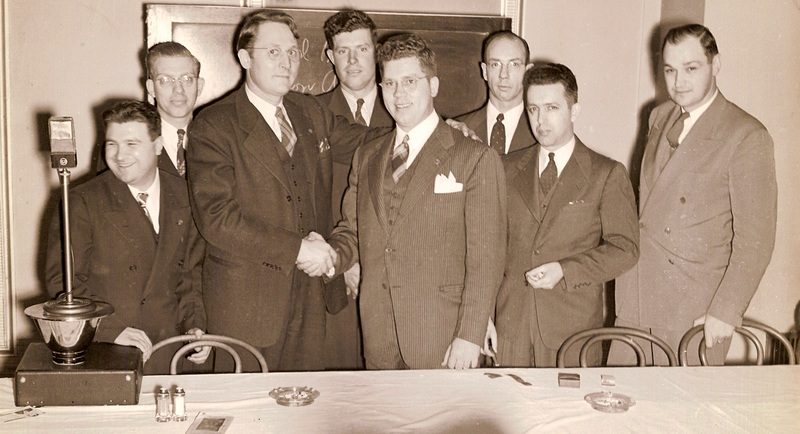 The first of two planned exhibits tells the story of two of the first three German Americans in the First Congress—Frederick and Peter Muhlenberg of Pennsylvania—with information about the Congressional Study Group on Germany, the German-American Caucus, and current members of Congress with German ancestry. The initial exhibit opens on October 4, 2011 in the rotunda of the Cannon House Office Building where it will be on view through Friday, October 7. A second exhibit will follow in 2012 focusing on German Americans in the United States Congress in the 19th and 20th centuries. Both exhibits will travel in Germany and throughout the United States. German immigrants were among the first settlers in 1607; over the next four centuries more than 7 million Germans followed. Today, 50 million Americans claim German ancestry. Like most immigrants to the United States, those from Germany came here seeking economic opportunity, religious freedom, and political liberty. From the remarkable Muhlenberg brothers who provided political and military leadership during the American Revolution and then served in the First Federal Congress (1789-1791) to the members of German ancestry who serve in the current 112th Congress (2011-2013), German Americans have provided distinguished service in the national legislature. This 14-panel exhibit will tell their story. 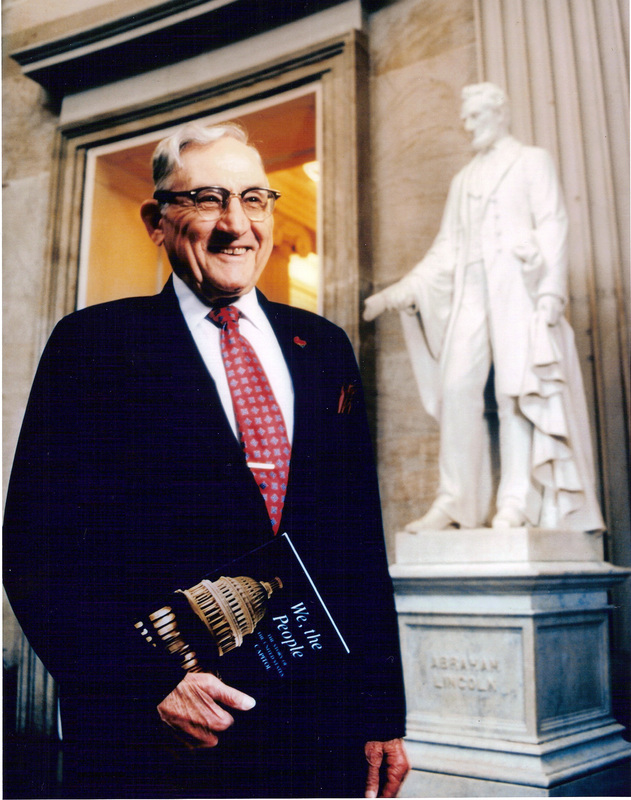 The U.S. Capitol Historical Society and the German American Heritage Museum gratefully acknowledge the donors who made the exhibit possible: Atlantik-Brücke E.V. ; Deutsche Post DHL; Deutsche Welle; Draeger-Stiftung; Embassy of the Federal Republic of Germany, Washington, D.C.; United States Diplomatic Mission to Germany. A web version of the exhibit will soon be posted on http://www.uschs.org, and our October theme on this blog will be German Americans in Congress.